Metro may now have to move up this massive shutdown project on the Blue, Orange and Silver Lines to be the first project. Blue, Silver lines would be shut down between Eastern Market and Benning RD and Orange line between Eastern Market and Minnesota Ave.
Shutdown could start in a couple of weeks. Metro is planning a 16-day closure of a stretch of the Blue, Orange and Silver lines after the Federal Transit Administration demanded immediate fixes from the transit system. Last week, Metro released a draft of its SafeTrack plan to focus on repairing certain parts of the system, which will lead to single-tracking and shutdowns in some areas over the next year. But the FTA told Metro in a letter Wednesday that it's going to need to shuffle its priorities and make immediate repairs to certain sections of track before beginning the SafeTrack plan. That means Metro may now have to move up this massive shutdown project on the Blue, Orange and Silver Lines to be the first project. It will require shutting down the Blue and Silver lines between Eastern Market and Benning Road and the Orange line between Eastern Market and Minnesota Avenue for repairs. Metro plans to move that part of the project up from August to June. “I think the sooner we get out there, the sooner we get out of this game,” Metro General Manager Paul Wiedefeld said. He said the plan isn't set in stone but there is no time to waste on any repairs. “When I sat there at the NTSB hearing the other day and just heard through the litany of the decades here, it just reinforced to me I just got to go,” Wiedefeld said. Metro officials said they are reviewing the FTA's letter to modify the final version of the SafeTrack plan. "While the draft SafeTrack plan issued by Metro GM Wiedefeld last week was based on the professional judgement [sic] of engineers with a priority on safety, the FTA has directed Metro to make changes," Metro said in a statement. "As such, the draft plan will be modified. The final SafeTrack plan will be released as soon as possible, but likely will not be ready by the original target date of May 16." The FTA said that between April 23 and May 10, it investigated 15 safety events, including nine events with smoke or fire. Urgent repairs are needed on three D.C. Metro tracks because of fire concerns, according to a letter sent Wednesday by the Federal Transit Administration to Metro's General Manager. 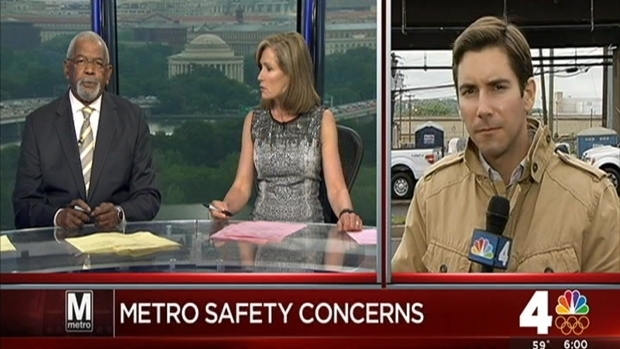 It came as Metro commuters dealt with new problems near the Stadium-Armory station. News4's Transportation Reporter Adam Tuss reports. New Metro Chief Safety Officer Patrick Lavin believes changing the hours structure of Metro maintenance could get huge results. "The perception at a lot of organizations is that you should get rid of your employees because look at the state of the system, right?" he said. "However, you need to get beyond that, because if you are not giving your employees the ability to have track access and make those repairs, then is it really that employee’s fault." Lavin worked for New York City transit for more than 30 years and said when he started in 1983, it was derailing a mainline train every 28 days. “I don’t think you have as great a problem in my mind that’s so insurmountable that it can’t be addressed with good effective leadership,” he said about Metro. Metro officials said last week that its massive maintenance plan, known as SafeTrack, is expected to repair 15 critical areas of the Metrorail system. It will cause serious disruption for riders -- General Manager Paul Wiedefeld called it a "7" on a scale of 1 to 10 -- including closing some stations at 8 p.m. on some nights, weekday single-tracking and closing the system at midnight on weekends.